This is one of the dish we all love here , when Shyama was in school and when she came home for lunch and saw that it was Meat balls she was really happy, she would say yumm or somtimes she ask before she go to school what are we eating for lunch and I would say Meat balls and then in the play time she would tell to her friends what she is going to eat for lunch and all the kids who are staying at school for eating would start drooling. Now that she is in college and staying there the whole week, I make for her and put them in a tupperware so she can eat them there too. I make and give her so much food that her friends there call her Microwave Queen as she just have to heat the food in the MW. We eat this mostly with potato mash or potato croquettes. 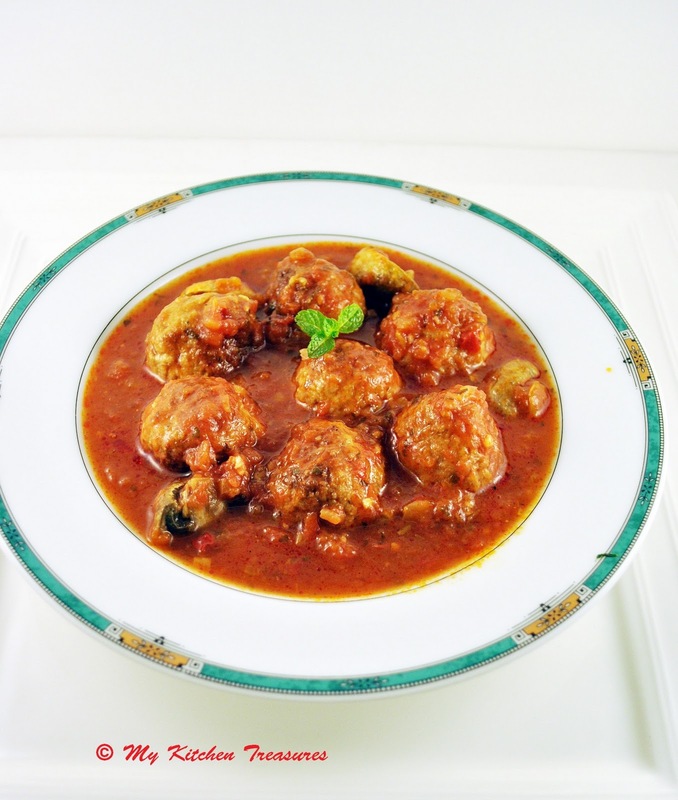 I have meat balls here with step by step pictures and in that post I served with pasta. I made this meat balls exactly as the earlier one but as I serve with potato instead of tomato passata I add a tin of ( 450 gm ) crush tomatoes which I mix into a puree before adding to the pan. Also add 250 gm mushrrooms halved, I add the mushrooms 10 minutes before the cooking time ends. haha microwave queen that a funny name HC but you are a very good mom. this curry looks real tempting. Looks delish! We are fans of meatballs too! 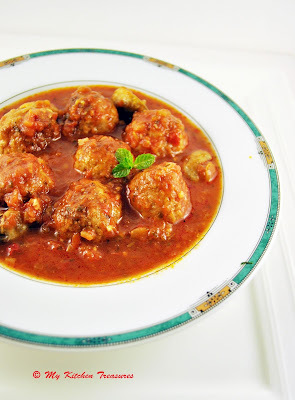 Slurp,thats a droolworthy dish,makes me drool..
U make me drool over this meat balls F. They look awesome! Meatballs are my favorites too! I bet they're delicious! Looks Yum!! Will try this today ! Microwave Queen :) Can imagine a sash with those words written on it draped across a young girl! A satisfying and mouthwatering meal! i'm hopeless at cooking meat, and your recipe for meatballs is next on my list to try.